HAFED Cattle Feed plant, Rohtak(Haryana) was set up in the year 1976 with the 100 MT per day capacity which was later on replaced with new ultra modern technology plant of 150 MT per day capacity (expandable upto 300 TPD) to increase the product range for manufacturing Cattle Feed, Poultry Feed, Piggery Feed & Mineral Mixtures to meet out all types of requirements of Dairy Farmers. It has facilities for manufacturing cattle feed, poultry feed, piggery feed & mineral mixtures, bricks and molasses urea bricks. 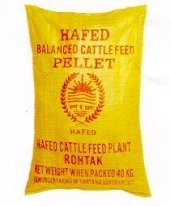 The consistency in quality and regular supply has earned a lot of goodwill for HAFED Cattle Feeds. HAFED had replaced existing plant with ultra modern technology new plant of 150 TPD capacity (expandable upto 300 TPD). The profit of 548.00 lac at Cattle Feed Plant, Rohtak during 2013-14 is ever highest since inception. HAFED has set up an Animal Feed Plant at Saktakhera (Sirsa),Haryana of 50 MT per day capacity in the year 2001. The profit of 100.44 Lac at Cattle Feed Plant, Saktakhera during 2012-13 is ever highest since inception.